Aric Almirola and Ricky Stenhouse Jr leads them to the starting stand. Kyle Busch will go to the tail of the field after pulling the backup car out earlier in the weekend. Green flag, Bowyer gives a huge push to Almirola on the inside line. Stenhouse is rolling the top. He’s at his right rear in turn three. Almirola holds him off in turn four. Lap 5, they’re four wide for 15th. The new rule package is cause of that. Lap 20, Almirola continues to lead Stenhouse by 1.7 seconds. Lap 35, the competition caution is out. Kyle Busch climbed to 12th during that short run, he started last. The field heads to the pit lane. Almrola is first in and Larson is first out. Restart, Almirola spins the tires on the outside line. Larson is clear into turn one. Lap 59, Kevin Harvick started 18th. He rolling the bottom lane and he’s up to 3rd. The crew made an adjustment on the chassis during the last stop, it worked. 5 to go in stage 1, Larson leads Harvick by 4.6 seconds. 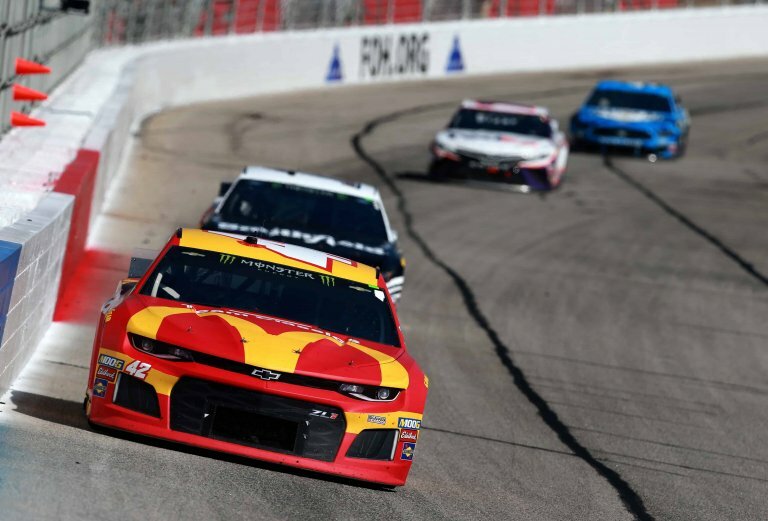 Kyle Larson wins stage 1 at Atlanta Motor Speedway! Larson leads the field to the pit lane. Harvick leads them to the pit exit. Almirola is too fast down pit road. Green flag on stage two, Larson and Harvick are even into turn one. Kurt Busch pokes through the middle of them. Three wide for the lead into turn one! Larson fades on the outline lane, they split him 4 wide. Busch gets loose into turn three. Harvick leads Truex and Kurt Busch. Lap 110, Larson is closing quickly on Kevin Harvick. Lap 112, Harvick gets loose after hitting the apron, Larson crosses him on exit. Larson surfaces to the lead. Lap 126, Larson heads to the pit lane to begin the green flag pit stops. 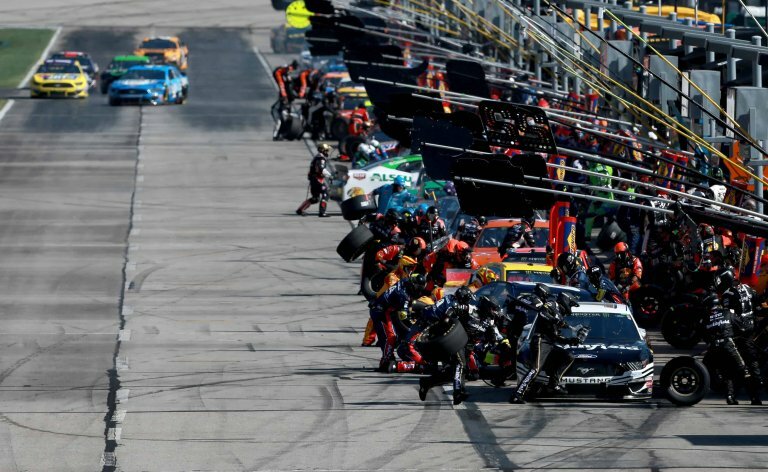 Lap 127, Harvick pits from the lead. Larson cycles to the lead by 2.6 seconds over Harvick. 18 to go in stage 2, Harvick has climbed to the bumper of Larson. He pulls ever in turn four. Larson fights back on the top in turn one. Larson crosses him off turn two. He cuts to the bottom in turn three and takes Harvick’s line away. Harvick pulls right to his bumper. “We’re just lucky he lets us race here,” Larson crew says over the radio. 9 to go in stage two, Larson looses air off his nose in turn three as he trails a lap car. Larson gets completely sideways and skates up the banking. Harvick slides through on the bottom to retake the lead! Kevin Harvick wins stage 2 by over two seconds. The field returns to the pit lane. Harvick is first on and first off. Larson will restart 2nd. Green flag on stage three, Harvick gets a push from Blaney on the inside. Larson hangs with him on the outside lane. Larson is clear on the top, he leads back to the line. Harvick falls to 4th. Truex is running down Kyle Larson. He’s closing slowly, lap after lap. Lap 220, the pit cycles are underway. Denny Hamlin is the first taker. Lap 222, Larson moves to the top lane, right against the wall. That didn’t work. Truex has a run on Larson off turn four. They remain side by side. Kyle Busch has a flat right rear! The caution is out. The rest of the field heads for the pit lane. Larson is first in and first off. Penalty: Larson is caught speeding on pit road. He’ll go to the tail of the field. Harvick leads them to the green. Restart, Truex locks bumpers with Harvick. The #4 jumps sideways over the bumps ahead of turn one. The outside has the advantage. Blaney noses ahead on the outside off turn two. Truex gives a huge push to Harvick down the back stretch. That pushes Harvick to the lead. 95 to go, Blaney heads to the middle in turn one. He has a run down the back. Blaney looks to the inside and Harvick leaves the door open. Ryan Blaney takes the lead. Harvick falls to 4th in a hurry. 75 to go, Truex is running down Blaney. 56 to go, Clint Bowyer heads for the pit lane. 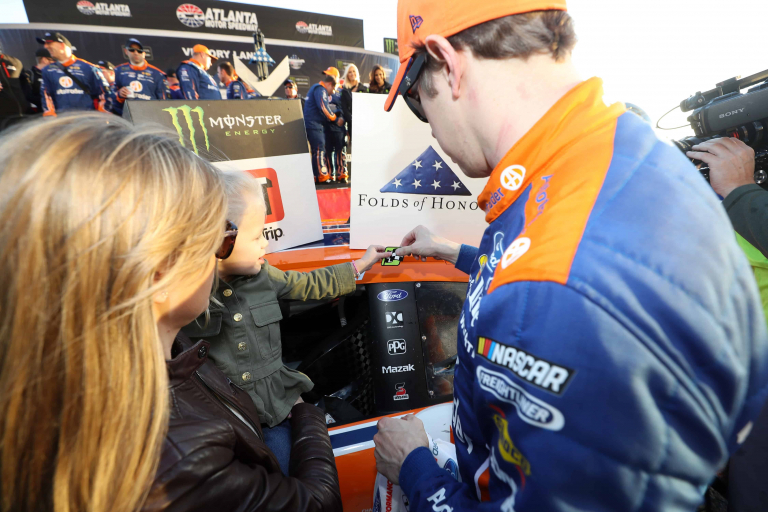 He starts the green flag cycle. 55 to go, Keselowski and Harvick pit. 54 to go, Larson is in. 53 to go, Blaney heads for the pit lane. Lap 273, Preece and BJ McLeod tangle on the pit lane. McLeod was hard on the brakes as he tried to reach his box. Preece was on the gas as he pulled out of his box. Preece says he was looking down at the tachometer. The caution is out with fluid on the track and the pit lane. Joey Logano and Kurt Busch had yet to pit. They have the entire field 1 lap down. They head for the pit lane and everyone is waved around the pace car. Blaney backed the car up while he was jacked up, fender damage. Logano will lead them to the restart. Green flag, Logano gets the jump on the inside lane. Kurt Busch fights back on the top into turn one. Side by side for the lead, four wide behind them. Logano is clear. 34 to go, Keselowski is on the leader’s bumper. Keselowski has a run off turn two. Logano throws a block and Keselowski gets him a shove. 33 to go, Keselowski gets to his inside in turn three. Keselowski leads off turn four. 21 to go, Logano heads to the pit lane with a loose wheel. 20 to go, Truex is clear of Kurt Busch to take 2nd. Keselowski leads by 3 seconds. 10 to go, Keselowski leads Truex by 2.2 seconds. 5 to go, Truex has closed to 0.5 seconds. 2 to go, Truex is there! Keselowski to the bottom, Truex to the top. Turn three, they both head for the bottom. 1 to go, Keselowski to the top in turn 1. Truex to the bottom. Keselowski leads off turn four. 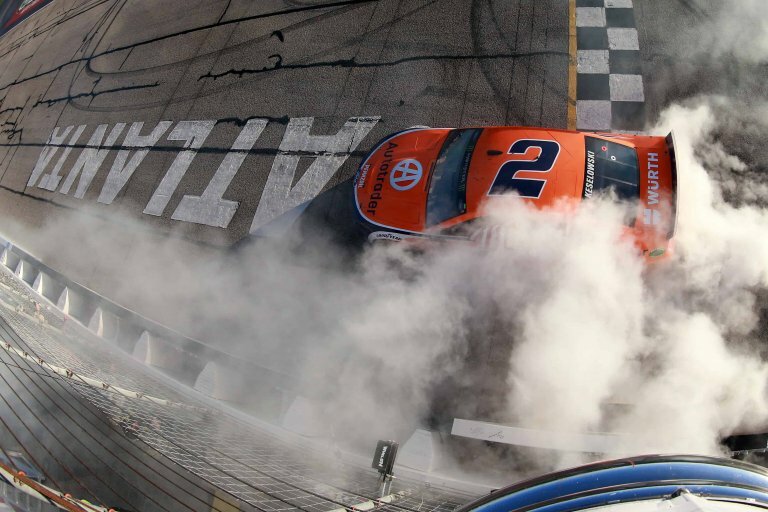 Brad Keselowski wins the NASCAR race at Atlanta Motor Speedway! 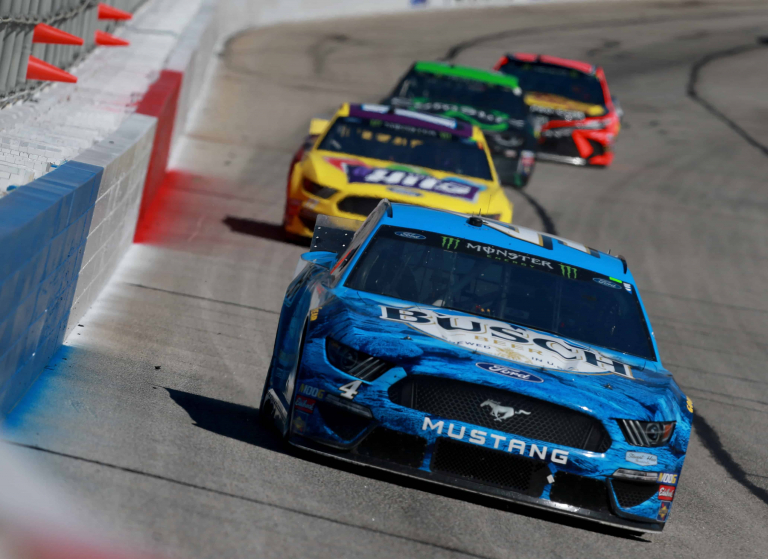 View full Atlanta Motor Speedway results for the Monster Energy NASCAR Cup Series below.